Every year, about 1.25 million people around the globe die due to road traffic accidents; which means- 3,400 deaths daily! However, over 90% of these deaths occur in economically backward regions alone. Low and middle-income countries in the African region are said to report the highest rates of road traffic deaths. 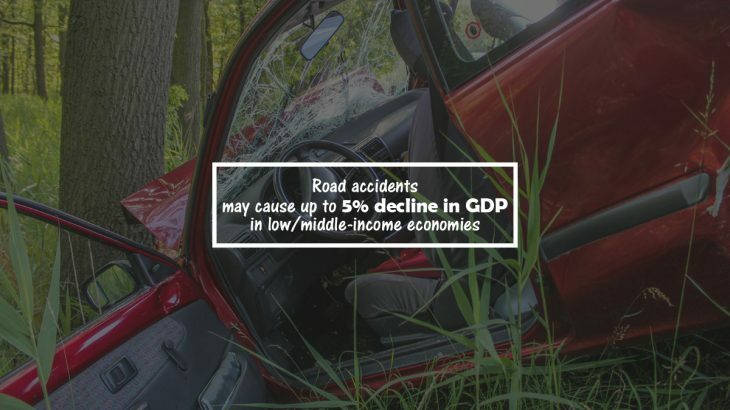 According to the World Health Organisation (WHO), the low and middle income economies may incur a loss of up to 5% of their GDP just because of road traffic accidents! A decline in GDP is a not at all a good sign for any economy, especially for those that are struggling to become developing/developed countries. But why is road accidents a more severe problem in economically week countries than in developed ones? How is a country’s economic power directly impacting lives of people? In countries like India, population is a major problem. The number of public transport vehicles provided by the State may not be sufficient for the masses. Also, since the population is more, demand for 2-wheelers and 4-wheelers is also more. As a result, roads that were already narrow have now become narrower. In fast metropolitan cities, people hardly get any space to walk, thanks to the bikers, car drivers, street vendors, hawkers, etc. Governments of many countries are blamed for not investing in good quality, planned public infrastructure and transportation facilities. Inferior quality materials are used to construct many roads and highways that sooner or later turn into death-beds full of potholes for commuters. Absence of sign boards and street lights also makes commuting risky. In many of the economically backward countries, driving and road safety laws are not taken seriously; either the laws are not framed properly or are not implemented well across all parts of the country. Implementation and monitoring of speed-limits and deployment of speed governors too is not carried out on a large scale. Moreover, these countries have fewer check points and officers to check drink-and-drive cases, over-speed cases, etc. Corruption nullifies economic growth and prosperity. And YES, this indeed can be linked to rising road traffic accidents. Corrupt officers, authorities, roads and highway builders and developers, etc. allow people to conveniently break road safety laws for personal gains, thereby putting millions of lives at risk. Many people in low/middle-income countries are ignorant of road-safety measures and rules. The number of awareness drives and campaigns carried out each year in weaker economies is relatively less. Post-accident care is miserable in many of the developing/ under-developed countries. Many people succumb to road traffic injuries as medical help and police do not arrive on time. Witnesses too refuse to help the injured fearing police case and legal proceedings. Many spectators have no idea about what to do to prevent the injured from dying. Moreover, many hospitals do not have the much needed intensive care units (ICUs) that could save lives of people. Now we know some of the key reasons why road accidents happen more in low/ middle-income economies, but less in the developed ones. If immediate, effective actions are not taken to solve the above mentioned problems, the countries will continue losing 5% or more of their GDPs. Governments have to involve multiple sectors (education, police, transport, and healthcare) to plan and execute effective road safety measures.